With the six seasons worth of data we have acquired we fished this past week knowing the fish would be there. All the science told us that we would catch five each during the current change. Well, all the knowledge and experience be damned because we couldn�t find a fish during the last two weeks. 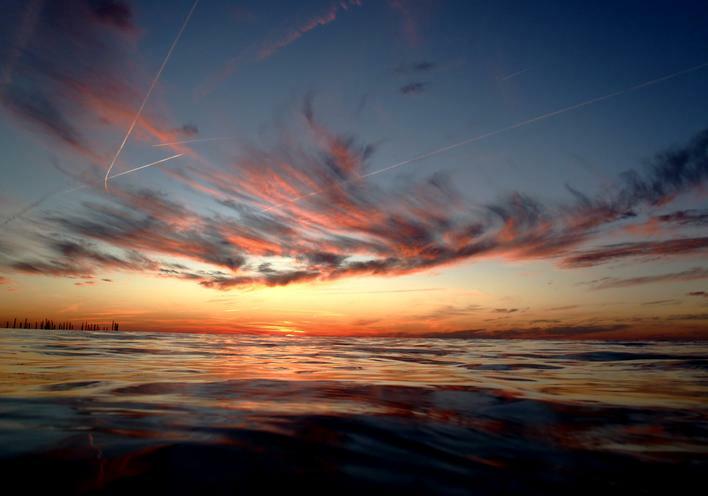 The water temps were perfect and didn�t drop to the dreaded 42 degrees during the past cold front. 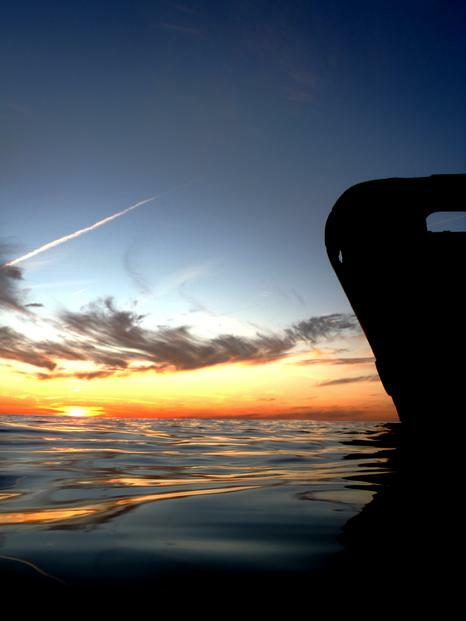 The waters around Kiptopeake were alive with silversides, menhaden and small shrimp but we couldn�t find a bite. Lee, Shante, Tex and Jay fished the rip during the days and the ships at night. These fish have thrown us for a loop. 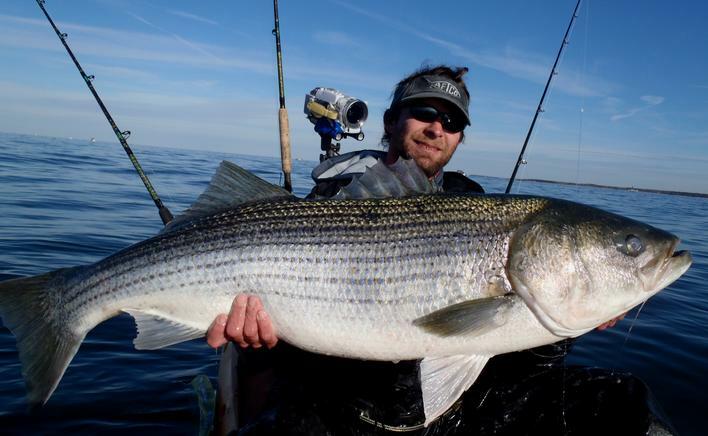 The only theory we can come up with is they have moved out into the ocean with all of the other stripers and all the crazy action that been going on out there. 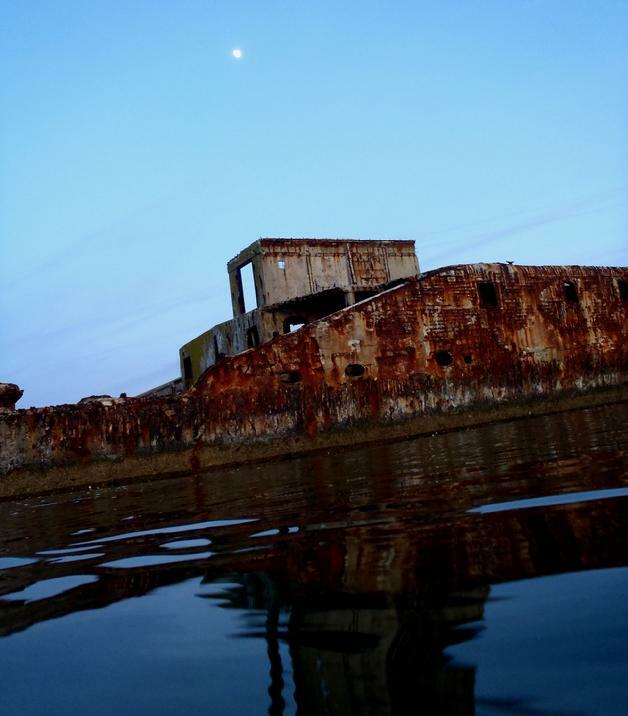 I�m not saying there are absolutely no fish around kipto but we couldn�t find any. Everyone made it to the ships at sometime this week. One day, Shante and Tex and I where pinned to the ships with 15 knot winds and no runs. Justin Mayer, Rob Choi, Tripp Seed, Jay Brooks and I hit the night time slack current another night with no runs. So, when we had the next window of opportunity I knew we had to go to the fish. The reports from the Plantation Light area where consistent and we had to go give it a try. Being it would be the first time we had ever attempted to fish the Plantation area the plan had to be tight. The area is 6 miles north of Kipto so its not practical to paddle from there. 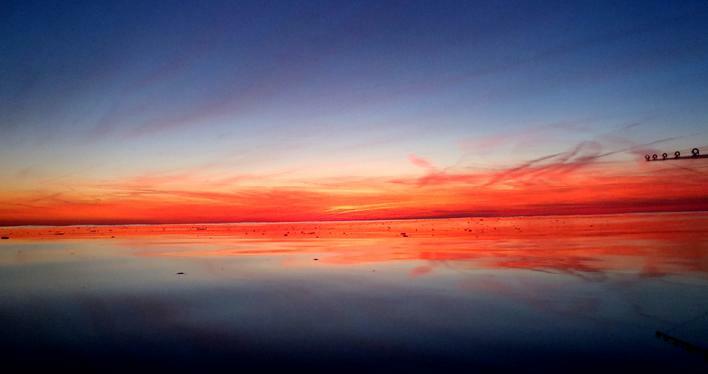 The area is three miles south of Cape Charles. We had an outgoing current till 8am, we launched at 6am to be sure we could get to the fishing grounds it time with the current before it ended at 8. We set eels down and trolled until we saw a boater hook a fish, we stoped and did the drift. Lee hooks up first and easily reels in a 34"er. Lee was unsatisfied with the fight and ready for a real one. Within 15 mins my down rod goes down with a incredibly hard fighting 46"er. 5 min later my free lines screams off with a thrashing 48" fighter. 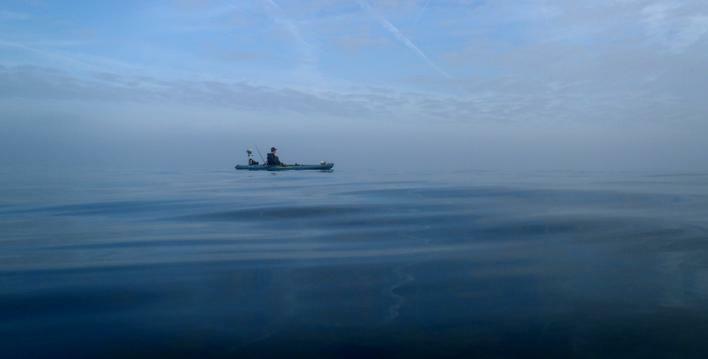 As the current began to turn we paddled south to set up for a longer drift. Again we paddled until we saw a fish caught and started our drift. Not long after my down rod line zipped off. I picked it up ready to set the hook but the fish quickly let go. With the rod back in the holder it, ran again, I picked it up and when I set it in gear, the fish let go again. This time I kept holding the rod but put it back into free spool, the fish grabbed it again, and this time I didn't give him time to let go, I slammed the reel into gear and set the hook into a 42"er. After landing and getting the shots, the freeline rod went off. This one was a cookie cutter version of the last at 42". We didn't get any shot of this one because Lee and Damien where both sick of me catching four in a row and where not going to come over to take any shots of this one. Although, every once in a while Lee would cast a eel under my boat. We drifted north with the current and only saw a few boats fighting fish during that time before we had to start paddling in. We all felt good with the success of a well executed plan and targeting a new area, the guys where messing with me being the hotrod of the day and where convinced that I made a deal with the devil. The night before, while I was in bed, I did ask King Neptune to just give us a shot at the fish. I asked that the fish would be there, and that we could have safe passage to and from. The next days forecast was for 10-15 knot winds so to my surprise when the winds dropped out I was able to jump out to buoy 18. 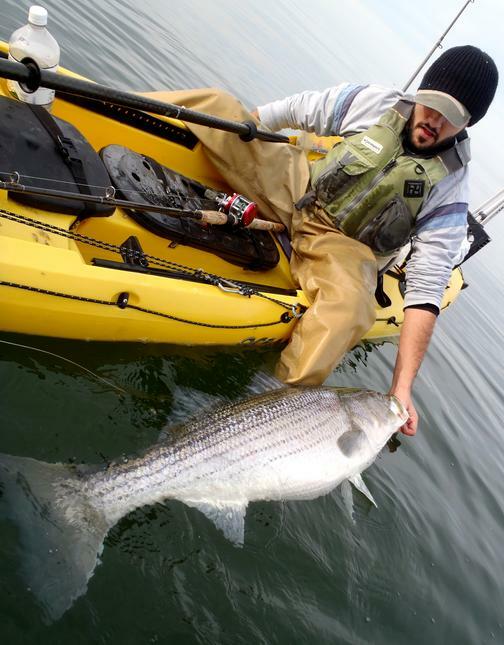 The action was slow only saw one 30" class fish caught before the winds started up and paddled in. It was worth the shot. 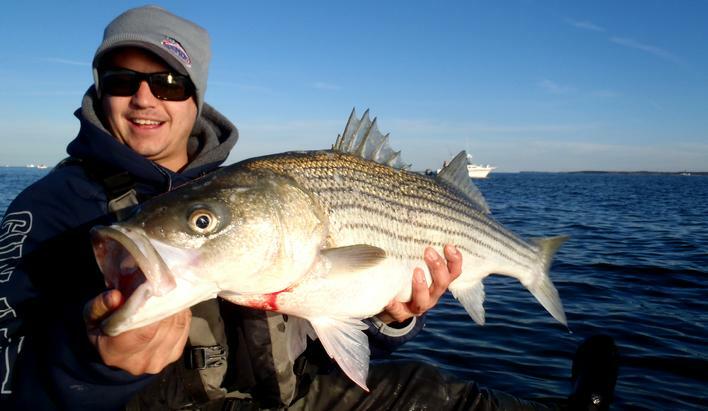 Remember the stripers that are in the bay are now targeted for catch and release only. We are going to have a strong cold front hit this week, it might stop the bite for a few days but another warm up is forcasted for next weekend. Typically in the past this did not push the fish out, only turn them off for a bit. When the water temps level off they will turn back on again, but this has not been a typical year. Look for those windows of opportunity this week, pray to king Neptune for a shot and get out and GET ON"EM! Fish where being caught with more frequency outside of the ships, so Damien, Shante and I were heading out for the drift. I stopped on the outside of the ships to rig my eels and get ready for the paddle/troll out. I dropped my weighted eel down and started working on the free-line, I felt a hard thump, looked at my rod tip and grabbed it as it started to bend! Shante just came through the ally, looked at me and said �Are you ####ing kidding me!! !� landed that 42�er got the shots and release footage, and dropped doped down for his buddy. 15 mins later as I was putting on my sweatshirt, my line went �Zip Zip!� landed that 44�er as Damien finally paddled up. After a while with no bites we headed out for the drift. We stopped about 500 yards off the end of the pound nets so Shante could un-tangle her lines and Damien�s live eel on a 2oz jighead rod went down. Damien landed his near 45�er. We began our drift right there. As we slowly drifted south we had one rod 15 feet down and one eel with no weight cast out. The free-line is the deal on a drift; it gets hit 90% of the time. After the free-lined eel swims down, I slowly reel him up. On one of these retrievals I had a striper grab at it. I didn�t have my drag set to strike and I missed �em. One another cast I put the eel on a stripers head, because it took 2 sec (actual time on the footage) for the line to start peeling off. I didn�t even have the rod set down before I set it tight. This one was the larger one of the day, a hefty 48�er. It was great having Shante back on the crew; she knows the footage and shot routine. Next week she will get another shot at a striper. The next day we could get out Lee and Tex and I paddled out for the same drift. The one boat by us had a run but other than that, it was nonexistent. The fog rolled in as we were out there. We could not see the shore line at all, so we couldn�t see how fast we were drifting. We paddled in to till we should see the end of the pound nets. I could see the tree tops and saw the cell tower� that was two miles south. We drifted down to sunset beach in 50mins. Well we figured we might as well keep on going, fish the high-rise at the turn around current and drift on back with the current. None of us was prepared for an all-day�er, we didn�t have any food, and we were only going out for three hours. I did find a pack of granola bars and about a dozen croutons. We had plenty of water so we were in no real trouble and we had a plan. The plan changed when the windy fog rolled in and it got cold. 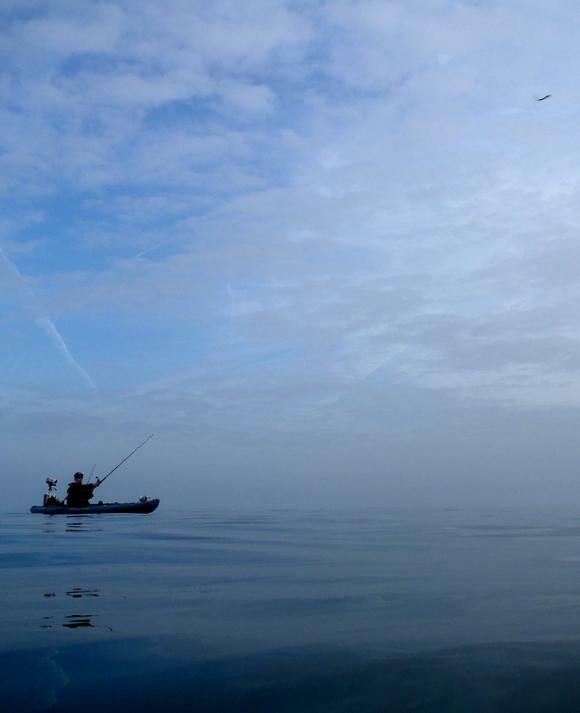 We didn�t want to fish the high-rise in fog and wind, so we started our paddle back a hour earlier, when the current got with us it was an enjoyable paddle. That was it for this week, I hope everyone has a merry Christmas and I hope you have time to get on the water and get a shot to GET ON�EM!!! Coming into our third week of big striper chasing with only seeing a few caught around me I was angry and determined, I had to catch one this week! Reports where coming into Chris's bait and tackle of big fish from buoy 18, two miles to the northwest. The plan was to make the 'drift' with the incoming current to the B18 and take the outgoing current back to the ships. A slight north wind forced us to troll it out. Jay from virginiakayakfisherman.com and I headed out trolling a weighted eel and a free line eel behind us. We found the rip line about a mile out and and drifted it for a few min. A boater stoped to give us some eels as they where heading in and showed me two fish they caught from the B18 area, so Jay and I continued on out. not long after leaving the rip my weighted eel 15 feet back went down hard, BAM! ZZZZZZZZZZ!!! my boat stoped and started to turn, I grab the rod ,tighten the drag as I spun around to face the fish as it rolled in front of me. 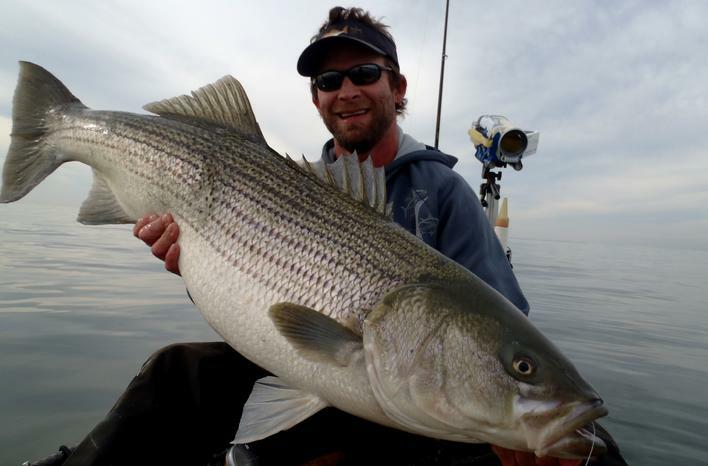 After a good hard spinning fight I was relieved to land and release my first big 46" striper of the season. Since Jay and I where on a mission to the buoy, we continued on out. We made it to the buoy as the current was turning around. We drifted as Zach Lannon, his buddy Byron, and one of my yoga instructors Bruce McGuire paddled out to meet us and we started to troll back in. About the same distance from the ships as I hooked the 46"er, the same line was knocked down!! After another violent fast spinning fight, landing and untangling the spider web around me from the other line, I released the 44"er. There is something about having a eel 15 feet back on the troll, no one else had a hit and my free line eel, way far back never got touched. 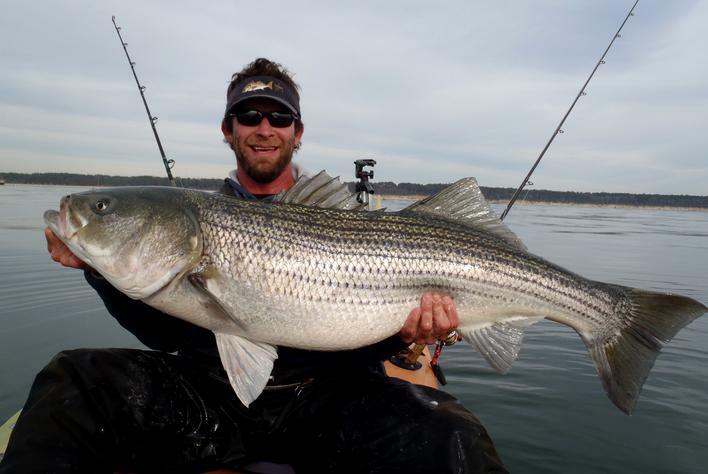 These aren't the first stripers in that same area I have caught while on the troll on the short line, my 52lber hit on that line four years ago. 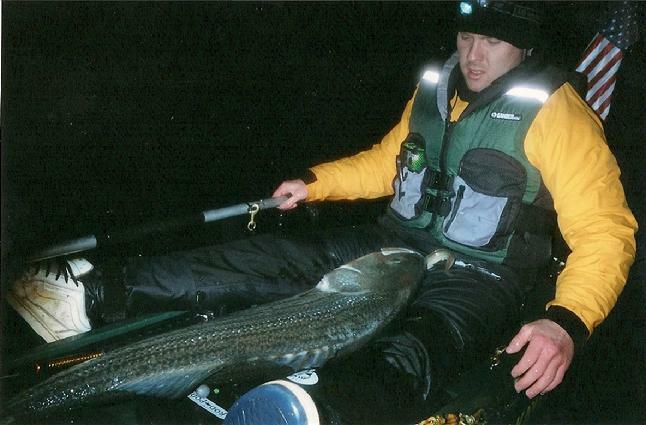 There has got to be something about the short lined eel behind the kayak. So far as of this weekend the forecast for this upcoming week looks mild, no super temperature dropping cold fronts to mess up the gradual lowering of the water temps. We are right in line with 2006 when we had them into January. But this could all change with a shift of the weather. 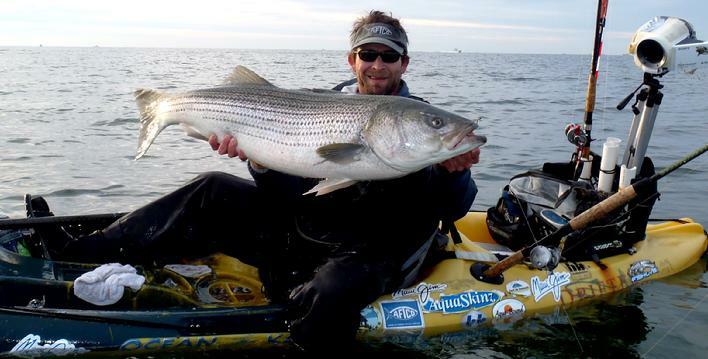 If you get a shot to get out on the water, get out and get your shot to GET ON'EM! 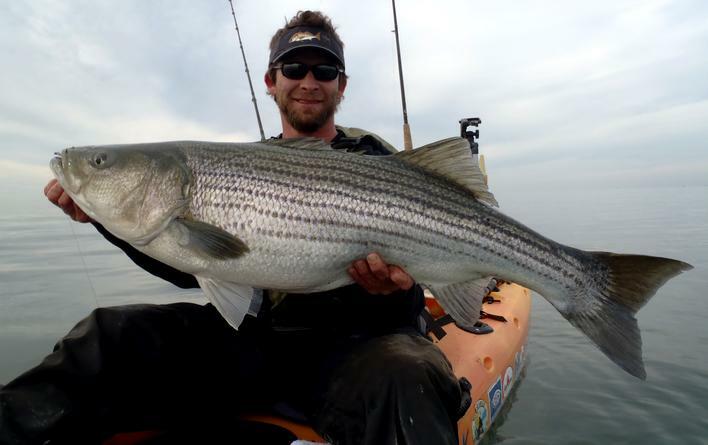 Lee and I hit the ships again this week and got skunked on the striper again. They were around, just not in the numbers yet. The first night the Wooten�s had the action during the slack current. Seth landed a 40�er and broke one off in the structure as did his dad. I was right next to them just waiting nervously for one of those fish to find my eel, as the current picked up my excitement dropped and we headed in. the next day we fished the morning slack, the water temps where at 54 degrees. Lee and I decided to make a quick target change and try for some togs. 55 is the prime water temps for tautog so we went on a bait run, got some clams and shrimp and dropped into our favorite tog holes. We picked a few smaller tog out and released before heading in to shift the target back to striper for the sunset slack current. The only fish caught was by a boater outside of the pound nets. It was great to see the Pirates of Lynnhaven and the New York kayak crew at the lodges for the weekend. 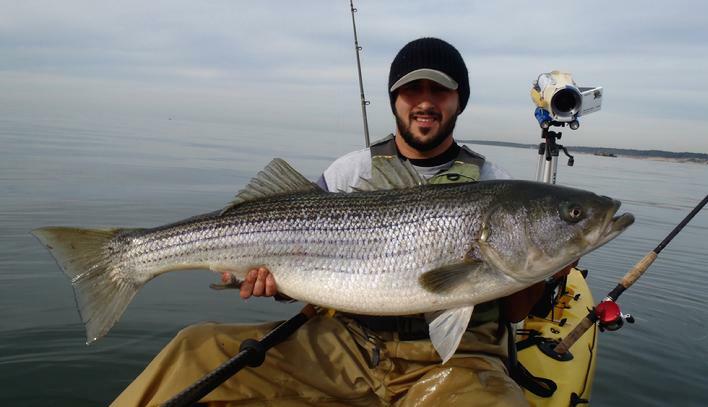 Even though the stripers were not cooperating I�m sure they had a fun weekend. Lee and only had a day and a half wind window to hit the ships this week. 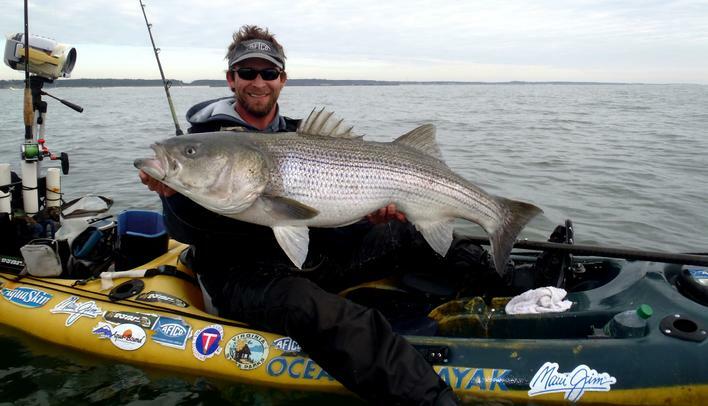 First, we were really surprised there was only one other kayaker, Johnnie Caldwell from Maryland, fishing the ships with us. It�s been time to be out there!! Fish have been caught at the high rise and at the ships. The first one (over 40�) was landed by Seth Wooten. Lee had a split second hook up on the first night. Could have been a dog shark, could have been a striper, but it was something. We hit the next mid-day slack current we both did the two line drift around the ships along with the Johnnie from Maryland, but we had no runs. We heard reports about the high rise having a great bite the night before so we decided, or I convinced lee that we might have a good shot closer to the high rise. So we headed south and Johnnie fished the ships. We saw had no runs, the boaters where seeing nothing on they�re fishfinders, we didn�t even have our eels get nervous. The next day Rob Choi calls me, Johnnie called him to tell rob that he caught a big one that night. My head dropped and I said �Lee is going to kill me!� the first thing Lee said was �That was my fish!� all joking aside we took a chance at a struck out and Johnnie stuck it out, put his time in and landed a fish of a lifetime. The thing about this season is the masses of big fish are spread out. Usually, the fish are bunched up and move down with the winter cold fronts. As the water temps drop the ride in the 50 degree water temps with the bait. This all gets pushed down with the cold fronts. 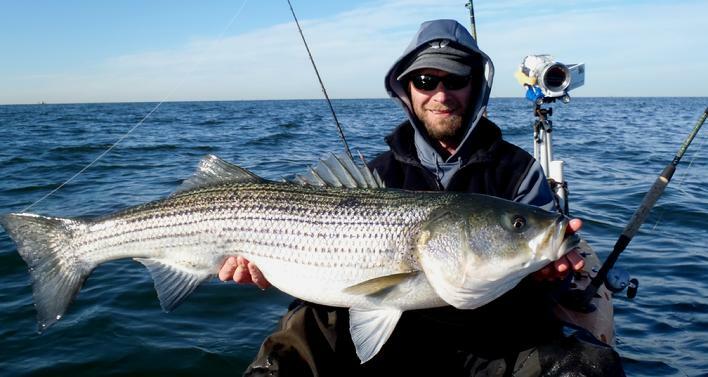 This unseasonably warm early winter has the bait and fish spread out from mid Maryland to us, here at the mouth in the bay, and in the ocean the fish are as far north as the Delaware Bay. We have a strong cold front coming late this week. This should push the rest of the fish our way. The water temps are in the low to mid 50�s, the cold front should bring em down to the target temps of 48 degrees. But don�t wait! If you get a window to go, get out there and take your shot, another cold front the week after next could knock it out. Get out there and GET ON�EM! Seth Wooten with the the first 40"er Seths is 45"